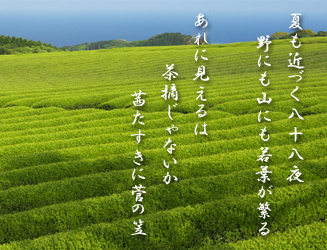 As the tea picking songs, 88 nights is strongly linked with tea on the day of the Japanese calendar. It means to count from first day of spring (4th February) to 88 days. The 88 nights in this year is 2nd May 2009. The old Japanese farmers could not read the seasonal change from "5 Sekke" (Chinese 5 festival) and "24 Sekki" (24 intervals calendar for 1year), made by China and the farmers created the Japanese calendar "Zatuku" (other intervals) complementally to the Chinese 24 intervals. The intervals are "Setubun","Higan","Nyubai","Nuhyakutoka" and "88nights is one of the intervals) and the "Zatuku" is officially adopted in 1686. As it is said "The frost in 88 nights", the time will become summer in calendar after 5 days but climate could be uncertain so the there is some frost in morning in this time. They use the 88nights as such measure " because it is 88nights so that let us prepare before the frost." To grasp the seasonal change precisely bring to prevent the big damage. As it were, it is wisdom of farmers. After 88nights, the climate is stable and it become to best time to sow. When it is "Keichitu" approximately 6th March after it is gone from the first day of spring to "Usui" approximately 9th February, sunshine is gradually warm. There are hint of spring day by day. When the Autumn Equinox day, when the day and night would be same long, is gone, the animals that hibernated come out and move together. Tea tree begin to take root in the ground from the fist days of spring and it is like hibernation during the winter and save enough nourishment from the ground and wait momentarily spring. The tea begin to sprout from old bud from "Seimei" when the cherry is full blossom. The tea receive "Kokuu", exactly same meaning in Japanese literally, blessing rain and then tea become new sprout that has a lot of Catechin, Vitamin etc at 88nights. The tea like this way, make living in the beginning in spring and receive and growing the all blessing during spring and plucked in the green of ignited in the end of spring. The reason why highly green aroma and rich nourishment and delicious. It become spring after 5days from tea plucking at 88 nights. Give 88 nights new season tea as gift to people yours! Since long time, it is said that the life will be starched if drink the 88nights tea because there are lots of nourishment.